What can be tested using visual methods in fiber optics? How does a visual fault locator (VFL) differ from a fiber tracer? What are other uses for a VFL? What can you learn from inspecting connectors with a microscope? Your eye can be a very useful tool in testing fiber optics. A visual light source can be used to trace fibers, ensure connections are correct and even find faults. A microscope lets you inspect connectors to confirm proper termination or determine if the connector is dirty and needs cleaning. Since most fiber optic networks use infrared light, your eye is not very good at detecting system light and if the power is high, you have no warning that it could be harmful (see "Eye Safety" below.) But many digital cameras can see infrared light and can be used to detect system light when you don't have an optical power meter. This lesson will cover all those topics. 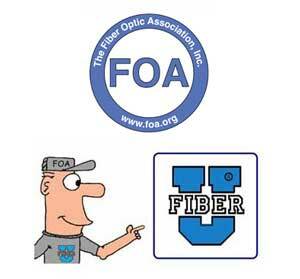 Eye Safety: A note on using any fiber optic source: Fiber optic sources, including test equipment, are generally too low in power to cause any eye damage, but it's still advisable to check connectors with a power meter or a digital camera before looking into it. Besides, most fiber optic sources are at infrared wavelengths that are invisible to the eye, making them more dangerous because you cannot see the light even when the power level could be dangerous. Connector inspection microscopes focus all the light into the eye and can increase the danger. Some telco DWDM and CATV systems have very high power and they could be harmful, so better safe than sorry. Read our page on Safety. The course leads you to read online or printed materials (with an emphasis on the online using the FOA Guide), watch FOA YouTube Videos, complete some activities and take the quizzes. Each lesson plan is self-contained. Lesson plans open in new pages so the course overview page stays open to lead you to the next lesson or you may use the link at the bottom of the page.